A loan of $300 helped to buy 10 cows' heads and 10 boxes of tripe to resell. Marta is married and has lived in Ponta de Ouro for quite a while. She has 4 children, 2 men and 2 women, who are all fully grown and this will be her seventh loan with Hluvuku-Adsema. 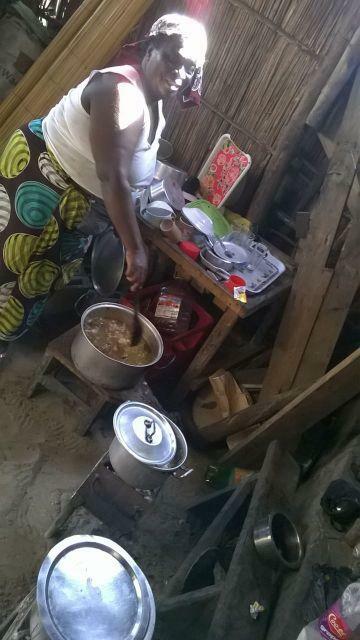 Previously, she has used her loans to buy domestic appliances (2 freezers and a stereo system) and to restock her business. She plans to use this loan to buy 10 cows' heads and 10 boxes of tripe to resell. She dreams of seeing her business grow and acquiring more goods which she can use within her shop, ad the greatest challenge that she faces is strengthening her business as it is her main source of family income. Translated from Portuguese by Kiva volunteer anonymized. View original language description. Sra. Marta é mãe de 4 filhos duas Sras. e dois Homens todos já maiores de idades, ela é casada maritalmente, residente da Ponta de Ouro já a bastante tempo. Cliente da Hluvuku-Adsema pela sétima vez, os créditos que foram financiados inicialmente teriam sido para compra de electrodomésticos (dois congeladores, uma aparelhagem sonora e reforçar o negócio), com o presente financiamento pretende comprar 10 cabeças de vaca e 10 caixas de dobrada para revenda. Tem como sonho ver seu estabelecimento crescer e adquirir mais bens que poderá usa-los no seu estabelecimento comercial. O seu maior desafio e fortalecer o seu negócio que e sua base de sustentabilidade. Hluvuku was one of Kiva's first partners, originally partnering with Kiva in 2006. Hluvuku was founded in 1995 in the wake of the Mozambican civil war with the objective of promoting economic stability and growth in a region that was severely affected by the war. Hluvuku operates primarily in the Matutuine district of Maputo province, a region that is extremely under served by financial institutions. Kiva’s funds have allowed Hluvuku to grow the number of housing loans they can offer. In addition, Hluvuku hopes to use Kiva funds to further expand their new agricultural product that is very tailored to the needs of clients in their region.